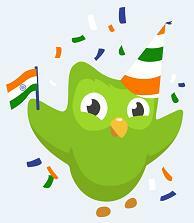 The Duolingo Hindi Course has been hotly anticipated by many of us for almost two years now. Unfortunately for us, the course was having considerably slow or no progress over the past 6-12 months with a lone contributor. So the CEO of Duolingo vowed to take action. And there we have it, a new contributor, Kanan, who we all congratulate and sincerely thank for taking on this huge responsibility. We all hope Kanan can find some contributors to help, and the course makes substantial progress once again. Savandwich for making this post regarding the lack of progress, which sparked much of the action. Goosefield for commenting that the CEO of Duolingo had decided to resolve these issues. Jitengore for the previous work on the course, regardless of the recent slow progress. And of course, the CEO for taking action on the course. Once again, we congratulate Kanan on receiving this new role and thank you in advance for doing your best at giving us the new Hindi course, both quickly and passionately. We thank all those involved in allowing this to happen, including the Duolingo team and cannot wait for the course's release! 24/6: It seems like Kanan has already contributed a fair bit, looking at the bottom of this page. 28/6: It has been mentioned that the contribution page mentioned above is a little buggy. Regardless, we have been assured the course will come quickly. Ahh that's amazing news! Thanks so much everyone :D I wasn't really expecting much to happen from the post but it was just getting so frustrating when every time I checked the progress it was still stuck at 59%... but it looks like we'll be getting the course at last :-) Congratulations and good luck to Kanan! I applied, KananG1 I hope you let me contribute because I would love to help English speakers around the world learn my native language of Hindi, if we get more contributors then Hindi course will be finished in no time. Thanks for this info. I have been waiting for 2 years for this course and now I hope it is in sight. Woah!! How many languages are you fluent in? Hard to say, unless we spend time where the language is spoken our knowledge is just academic. I have joined just a few days ago, and it is not humanly possible for me to have made 19% contribution so quickly. Being a contributor in the reverse course for some time (if I'm not wrong), you made work there that reflects also in the reverse course. This explains your 19%. Thanks so much! You will be looking for new contributors soon, right? Yes, certainly. Once I have a plan on how to design the course, I will be sending out invites for new contributors. I hope you are, about 97,000 people have asked just to be notified when the course is done, Hindi for English is the only Phase 1 course with 1 contributor, thanks for your work but if we get more contributors, at least the BETA will be in sight sooner. How are you going with the course assessment? Do you have an idea of where the course progress stands? It would be great if you posted an announcement on the course page and updated the estimated date if needed; we want to hear everything about it! Unfortunately, there is not much substantial content in the incubator for this course as of now. Only some skills teaching the script are there but even those are not complete. So it is akin to beginning this course from scratch. I do plan to post regular announcements. I am still in the research phase and would not be able to make any predictions about the estimated date right now. But I would want to make sure that when this is the last time when the estimated date would need to be updated. you mean you have to start everything over?